At the Western Cemetery on the Giza Plateau are located six Old Kingdom tombs of nobles and top officials of the Fourth Dynasty, waiting for their official opening after restoration. Although these tombs may be sparse in decoration, they are rich in architectural features. Discovered early in the last century, the tombs have impressive facades, more like temples, and large chambers with rock-hewn pillars. The first one belongs to Princess Mersankh, the granddaughter of King Khufu. This tomb was originally built for her mother, Queen Hetepheres II, but on Mersankh's sudden death the tomb was donated to her. The tomb was discovered in 1927 by archaeologist George Reisner where a black granite sarcophagus was found along with a set of Canopic jars, and a limestone statue depicting Queen Hetepheres II embracing her daughter. 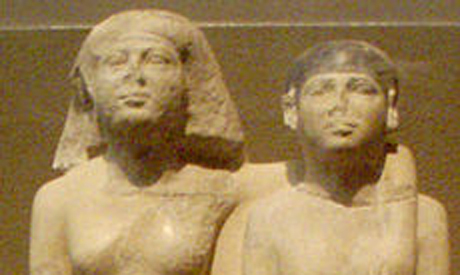 The sarcophagus is now in the Egyptian Museum in Cairo while the statue is in the Museum of Fine Arts in Boston. The second tomb belongs to Seshem-Nefer, the overseer of the two seats of the House of Life and keeper of the king's secrets. “It is one of the largest tombs on the Giza Plateau,” Ali El-Asfar, director general of archaeology on the plateau, told Ahram Online, adding that it contains funerary, hunting and offering scenes, as well as a depiction of the Seshem-Nefer's daily life. The third tomb belongs to Senefru-Kha-Ef, the king's treasurer and priest of the god Apis. El-Asfar said that the tomb’s inner walls also reveal typical scenes of the dead official and his children. The fourth tomb was constructed for Nefer, the overseer of the soul priests. Its walls are decorated with scenes showing the Nefer's daily life with his family and dog. The fifth tomb belongs to Yassen, the overseer of the king’s farms. The sixth tomb was for Ka-Em-Ankh, overseer of the royal treasury. 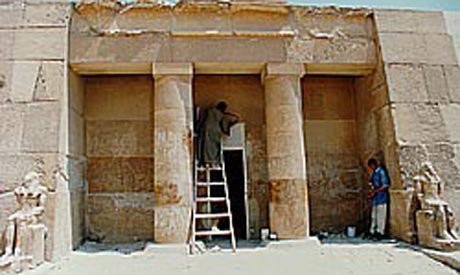 According to Mohamed Ibrahim, minister of state for antiquities, the walls of the tombs have been cleaned and reinforced, graffiti left by visitors removed and inscriptions and paintings conserved. The walls are now protected by wood, and lighting and ventilation systems have been installed. A path linking the tombs to the Great Pyramid of Khufu was established in order to facilitate visits. These tombs were previously opened 25 years ago, said Ibrahim, adding that they were closed for restoration according to the rotation system introduced at the Giza Plateau in the 1990s, under which some of the noblemen’s tombs will be closed for restoration each year. “Regretfully they were never opened again,” El-Asfar said. As they open now, others will close for restoration and preservation.